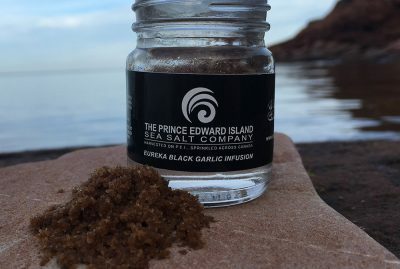 Our Finishing Salts – PEI Sea Salt Co.
We’re all familiar with salt. It is not just for seasoning and preparing food, nor is it only the most important ingredient in your kitchen. Salt is essential to the biological health of our entire eco-system. Over the years, salt has evolved in many ways – much like our society. Prior to industrializing this commodity in the early 20th century, there were no additives or anti-caking agents added to what we’ve commonly come to know as Table Salt. We started our Salt Farm based on one principle: Making the best-unprocessed sea salt possible. We soon learned our true identity. We use a combination of heritage techniques and modern technology in our salt making process. Our sea salt is produced in small batches using carefully timed and controlled heated evaporation. When our brine begins to crystalize, we meticulously hand harvest every grain and then air dry. At no point do we add any type of additives or declumping agents. Our salt is pure, clean, crystalized sea water and absolutely nothing else. In many ways our salt harvesting methods are behind the times. However, we feel we’re so far behind we’re ahead. Start to finish our salt production takes about three weeks. It is an intensive process – a true labour of love. The necessity of this slow and low process is proven by the quality of the finished product. Our sea salt is truly unique – showcasing a tangible mixture of natural ocean moisture and diversely crystalline flakiness. Over the years of refining our Salt Farming technique, we’ve introduced a handful of flavour infusions – collaborating with some of our esteemed local partners to rave reviews. Dig your fingers in and sprinkle us onto your cooked protein and vegetables. Add extra crunch and balance to the top of your chocolate chip cookies or ice cream scoop. Upgrade your homemade vinaigrettes with a new dimension of briny tang. For best enjoyment, all of our salts should be used either as the very last step in cooking or directly on your plate. Save us for the end, we are above the rest. Our Sea Salt is truly one of a kind. We collect Atlantic sea water from some of the cleanest ocean waters on the planet. When the tides are coming in on the north shore of Prince Edward Island, we go to work. 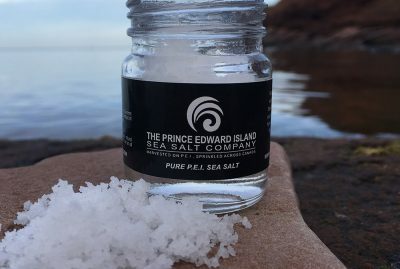 From collection and curing to packaging, PEI Sea Salt Co. is an authentic craft offering from the waters of Prince Edward Island, handmade by Islanders, for the world to enjoy. 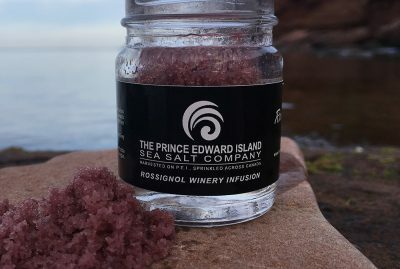 The Rossignol family is well known in Prince Edward Island for having the first local winery producing an array of varietals on our red soil terroir. The Marechal Foch, a dark smoky red, is hand-blended with fresh harvest crystalline sea salt – and the result is as beautiful as it is delicious. You’ll want to blend this with fresh cracked black pepper to rub down every single cut of beef for the BBQ, slow-cooker, oven or skillet. Finish a roast chicken or seasonal root vegetables with this amethyst-hued garnish and showcase your personal culinary art to family and friends. Receiver Coffee purchases Fair Trade beans from international farmers as far away as Africa and Central America. 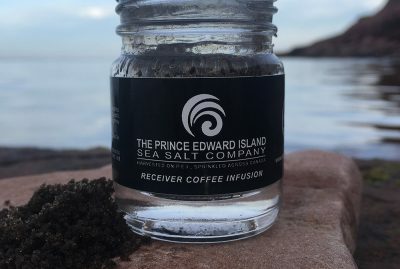 The beans are roasted in Charlottetown, producing an array of blends that have become Island favourites. While coffee and salt are not something you’d typically think about together, the way the flavor profiles mingle with each other will add another dimension of taste to BBQ dry rubs and marinades. Sprinkle on vanilla bean ice cream if you’ve ever enjoyed salted caramel or espresso gelato. A bit of an intensive undertaking, black garlic is the product of a time-tested method of heating and drying whole bulbs of garlic over the course of a few weeks. Al Pickett, of Kensington’s Eureka Garlic, has become a local legend for his mastery of this process. The resulting “black” garlic and its darkened cloves present a new flavour profile altogether: sweet and subtly savory – reminiscent of caramel, aged balsamic reduction, and black truffle. Garlic salt is a staple in every pantry across Canada – time to step your game up.